"Knowing that you like a spot of NIMBY outrage I thought I'd send you this photo of Creekside Truck Park. 5 x 8-wheeled tippers (empty), 1 x artic full of steel, 2x white vans – one of the white vans completely blocking the pavement. Queue of cars in both directions struggling to get round the obstructed corner, observed Thursday 14th April at 08:20. Cheers, San". Theoretically, Crossfielders are living next to and surrounded by building sites. However, the conditions created by the construction work going on at Faircharm, Kent Wharf and two Tideway Tunnel sites makes many of us feel like we're actually living on a building site. No sooner had scaffolding come down on most Crossfields blocks five months ago – after noisy, dusty and highly controversial external works had finished on the estate itself and most of which was unnecessary – than work began in Creekside at Kent Wharf (Bellway Homes) and Faircharm Trading Estate (Workspace plc). Residents who grapple with the vagaries of the public transport system when they go out to work are lucky to miss the all-day noise – unless they have late starts. In most cases everyone's morning alarm is the sound of trucks queuing up outside the window, a sound heard two blocks away. Having missed the extraordinarily loud noises during the day, when commuters get home they can enjoy the new layer of dust on their doorsteps, windows, paths and road. 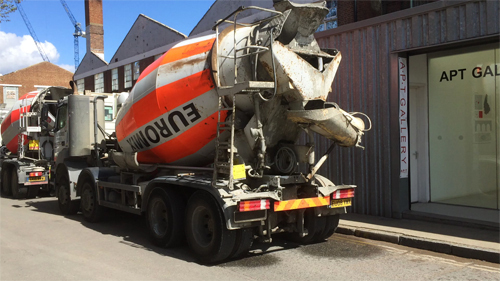 The cement mixers began gathering on Creekside at around 8.30am and were still queuing at 2pm. Without any notice. Without any notice whatsoever, for the past two weeks Creekside has been closed to through traffic by Murphys, the contractors for Tideway Tunnel. 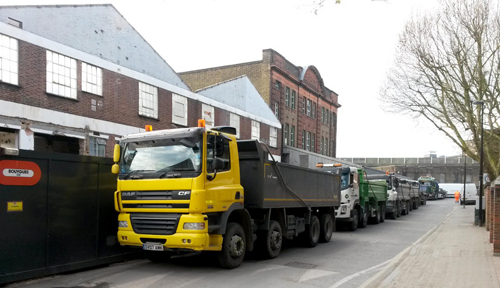 Whilst inconvenient for local residents, this has the upside of stopping the road being used as a rat-run when this week Deptford Church Street was partially closed by – guess who – Murphys. Tideway Tunnel did give notice for that – the first newsletter said it would be overnight with the future prospect of an 11 month closure; a subsequent letter said it wouldn't just be overnight but in fact would be for the next 8 months. A road sign at the start of the newly marked northbound single lane says 52 weeks (er...that's 12 months), whilst at the start of the single file southbound lane it says 48 weeks. So far, traffic has run fairly smoothly; the 47 bus's Wavelengths stops on either side of the road have been moved south where there is room for overtaking (but with NO SHELTERS – not good at all). 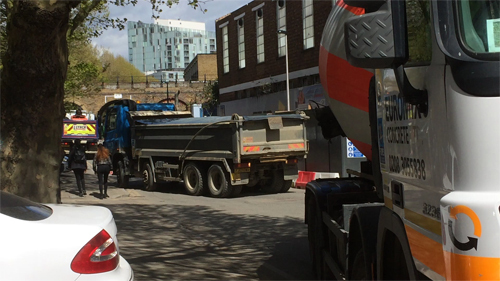 HGVs have been spotted sneaking up Frankham and Giffin Street (using the high street as a rat-run – but that was already happening), whilst emergency vehicles have been slowed down, as we predicted. In quiet moments, flashy types have been seen showing off as they expertly navigate the snaking single lanes at rally driving speeds. But on the whole, it looks as if traffic may be avoiding the area and possibly clogging up routes and rat-runs in the surrounding area instead. Of course, the real test will be when there is an accident elsewhere or one of the tunnels is closed. Meanwhile, traffic on Creekside is often blocked by lorries entering and exiting Faircharm, holding up local residents' arrival and exit. Not that they can find a parking space when they return during the day, since spaces are filled with construction workers' cars – despite signs for Residents Only parking. Residents Permits (rejected by generous but short-sighted residents previously) may be a priority now, if not for the future – since there will be no parking on the new developments. We'll take a more detailed look at the woes of living in a construction site in a next post or two (there are no joys). We'd love to know what Lewisham Council think, and hope they will be able to help, though it all seems to be out of their control. The Lenox Project (aka Build The Lenox) and Sayes Court Garden are the community projects which fought long and hard to gain a place on Convoys Wharf, site of the former Deptford Dockyard now owned by multinational conglomerate Hutchison Whampoa who intend to build 3500 luxury flats there. 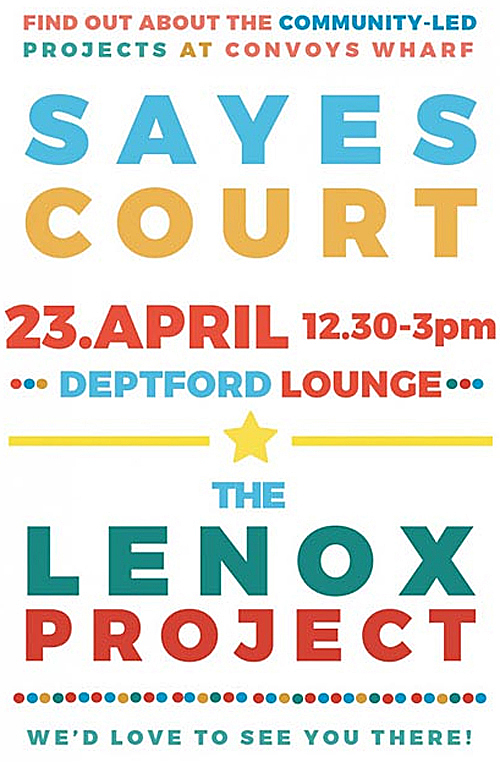 Sayes Court Garden want to build on the legacy of John Evelyn, Deptford's famous horticulturalist and diarist whose original Deptford garden, Sayes Court, gave birth to new scientific ideas and cultural changes. With support from the National Trust, they aim to create outdoor and indoor spaces that explore 21st century ideas around sustainability, climate change, health and nature with the idea of the garden as a living laboratory and tool for thought. Read more at www.sayescourt.org.uk (aka exploreeverything.org). Since Boris Johnson 'called in' and decided on the Convoys Wharf application on 31st March 2014 nothing much has happened on the Convoys Wharf site except an increase in security to prevent travellers gaining occupation. As yet, no detailed building designs have been submitted. Meanwhile, the two home-grown heritage projects who Boris made a condition of planning as part of the obligatory Section 106 agreement, have been up working up their plans – despite having received hardly a penny of the Section 106 monies paid to Lewisham Council on their behalf to date. The Lenox Project were first required to undergo an independent feasibility study to determine where on the site they could establish themselves – this was only completed in December 2015, some 18 months later. Unfazed, the project has subsequently published a revised Vision document which focuses on the chosen location – at the north west corner of the site next to Pepys Park, the opposite end to where the ship was originally built. 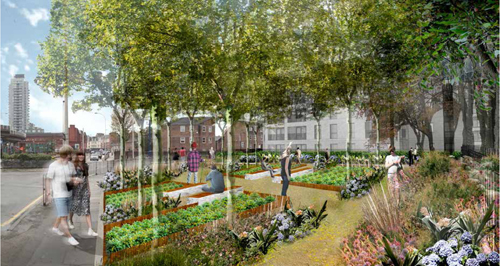 Sayes Court Garden have since been holding schools workshops and working with students from Greenwich University, liaising with architects, planners and designers, and contributing to national and international exhibitions, lectures and discussions. 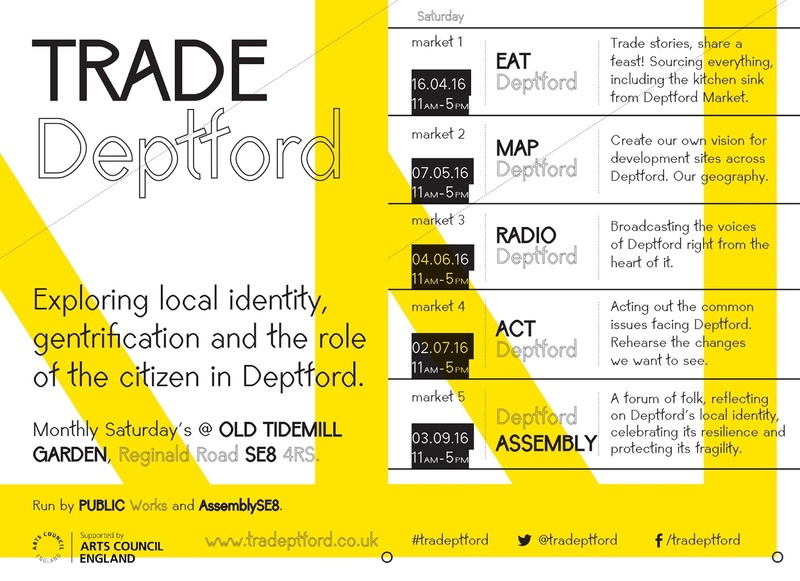 Both projects hope to bring local people up-to-date with their latest news at Deptford Lounge on Saturday 23rd April, 12.30–3pm. Go and say hello to them! The annual New Cross & Deptford Free Festival opens this Friday and runs till Sunday 1st May. 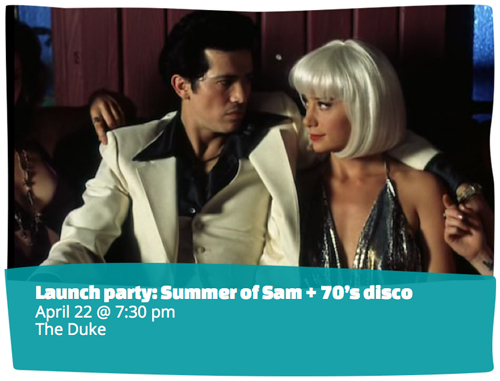 Fancy watching a film on a boat, in a church, by the Creek or other unusual local location? Or in one of your favourite bars – for free? 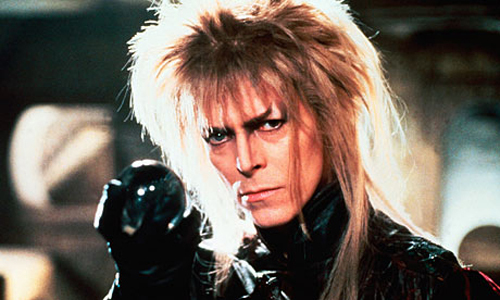 Some of the film showings include DJ sets and/or talks, and of course the festival would be incomplete without an outdoor, bike-powered screening – this year it's a Bowie film (natch) in Telegraph Hill Upper Park. Whilst objections may come from many different perspectives (residents in Reginald Road and Hales Street and the environmentalists in the old Tidemill Wildlife Garden), we take a look here at how the proposals adversely affect Frankham House residents. Last July, the Council 'appropriated' the Tidemill site 'for planning purposes'. The accompanying report stated its purpose was "in order to enable the powers in Section 237 of the Town & Country Planning Act 1990 to be used to ensure that any restrictive covenants or other rights affecting the land can be overridden in the interests of the proper planning of the area, thereby allowing the redevelopment of the land to proceed". Plan 1 Deptford Southern Sites July 2015 (drawn 2014). The green amenity is bottom right. 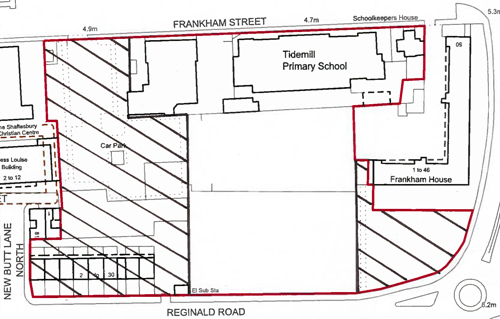 The appropriation took in the Council-owned land surrounding the school site, including the green amenity adjacent to Frankham House which borders Reginald Road and was hitherto part of Creekside Conservation Area, along with Frankham House itself. It is proposed that part of the green will now be built on, and the rest of it be used as a site compound during construction. 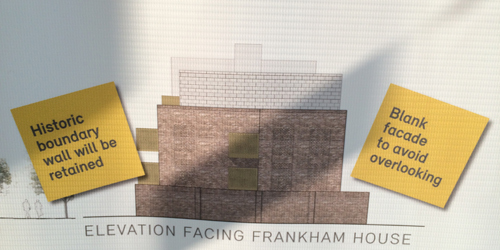 Hoardings will surround the perimeters of Frankham for the duration, which is presently estimated to be 20 months, but could be more. The ground floor of the south-facing elevations will lose the sunny outlook they've enjoyed for over 30 years (in some cases) when hoardings go up a few metres from their windows. In the Conservation Area Appraisal and designation (2012), Frankham House, along with the other blocks on Crossfields Estate, was recognised as "a good example of its time" and Crossfields is "only the fourth social housing estate within the borough that has been identified for its special architectural and historic interest in its own right, and the first 1930s estate to be recognised as such". Frankham House in particular is noted for "its role in forging an urban gay identity in the 1980s" (hence the name Pink Palace for the TRA accommodation within it). A Supplementary Planning Document (SDP) that should have laid out management guidelines for the preservation and enhancement of the conservation area has never been written. In the Scoping Report prepared for the non-existent SDP, para 14 states that one of the key objectives is: “To protect and enhance heritage assets and their setting, and use the historic environment as a cue to be recognised in new development and for the creation of sustainable places”. The integrity of the Frankham House building is now threatened by the proposal for an extension to the old Tidemill school building, with a resulting loss of light and outlook for west-facing Frankham House residents. A small two-storey schoolkeeper's house will be demolished to make way for the extension. The school-keeper's house is described by the temporary conservation officer as too common an example of its kind to be worth retaining – and yet there are hardly any buildings of its kind left in Deptford. And the proposal to build a five storey block (Block D) on the green will create significant overshadowing on Frankham's south-facing elevations. The illustration below was shown in the consultation today but is not included in the application documents. (It shows early morning light, so the impact on Frankham cannot be seen). The 2015 Appropriation report goes on, "the developers are carrying out daylight and sunlight studies to assess and seek to minimise the impact on local properties. Further, they are using key principles of maximising daylight and sunlight, creating attractive amenity spaces and ensuring careful consideration of relationships to neighbouring properties." In the developer's January 2016 application, the Daylight/Sunlight and Overshadowing studies illustrate predictions for March (but not other times of the year when the days are longer, or indeed, shorter). The drawings show Frankham's west- and south-facing elevations being overshadowed when there was no overshadowing before. But the 3D drawings accompanying the study use a north-easterly aerial axis that obscures any view of Frankham's west and south elevations. The real impact on Frankham House is not shown. Para 6.9 of the Appropriation report says: "Assessment of compensation for the loss of rights would be calculated on the basis of the before and after market value of the affected properties. It will be for the owners to demonstrate that that the loss is likely to cause inconvenience to them and affect the enjoyment of their properties and to substantiate any claim for compensation". 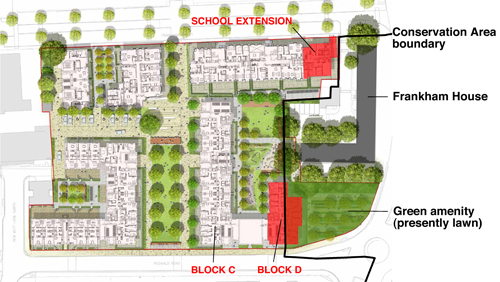 Para 10.5: "Therefore, in reaching his decision, the Mayor needs to consider the extent to which the decision may impact upon the Human Rights of estate residents and other affected persons and to balance this against the overall benefits to the community which the redevelopment of the Excalibur Estate* will bring. The Mayor will wish to be satisfied that interference with the rights under Article 8 and Article 1 of Protocol 1 is justified in all the circumstances and that a fair balance would be struck in the present case between the protection of the rights of individuals and the public interest". So, the Council has made sure the developer is protected from any claims for compensation, and if it passes this application in its present state, will be harming the human rights of its existing tenants in order to accommodate the rights of new mostly private residents. Affected existing residents can only claim compensation if they can prove (at their own expense) after the development has been built that the value of their properties has decreased. Firstly, it is unlikely that values will drop (if inflationary estate agents like Cannon Kaller have anything to do with it), and secondly, no amount of money can compensate for the loss of quality of life. Thirdly, it is stated that only 'owners' can claim compensation – how are tenants supposed to prove the value of their property has devalued? At least 12 Frankham tenants will be severely impacted by these plans. They can't just sell up, they are trapped. Their only recourse would be through the courts. A Right To Light expert tells us that local authorities often appropriate land so that developments can proceed without the risk of an injunction being sought against proposals. Where a 237 order has been agreed, it reduces the level of any compensation that residents (both leaseholders and tenants) are entitled to in a Right To Light case. Para 10.4: "In determining the level of permissible interference with enjoyment the courts have held that any interference must achieve a fair balance between the general interests of the community and the protection of the rights of individuals. There must be reasonable proportionality between the means employed and the aim pursued. The availability of an effective remedy and compensation to affected persons is relevant in assessing whether a fair balance has been struck". We do not believe there is "reasonable proportionality between the means employed and the aim pursued" and certainly not a "fair balance". Why should Frankham House residents (and of course, those in Reginald Road) suffer so that the developers can cram more units onto the site, or create, under the guise of providing a "major new public space", a pompous grand central avenue that affords new mostly private flat dwellers more right to light and privacy than existing residents will receive? And which will be overshadowed by the flats most afternoons anyway? Any what's the need for a hard paved square when there is one a stone's throw away (Giffin Square)...? Looking north, the new public open space, overshadowed every afternoon. Lewisham's Supplementary Planning Document (SPD) on Residential Standards states "The minimum distance between habitable rooms on the main rear elevation and the rear boundary or flank wall of adjoining development should normally be 9 metres or more". The proposed Block D is positioned too close to Frankham House, infringing on the outlook and light of south-facing residents. The maximum distance is 16 metres but the smallest gap is just over 10 metres – this encroachment allows for the 4-5 times as wide avenue between Blocks C and B, an edifice for which there is no justification other than to replace the green lungs of Old Tidemill Wildlife Garden with a manicured (yet overshadowed) public lawn in the middle of a road to nowhere. 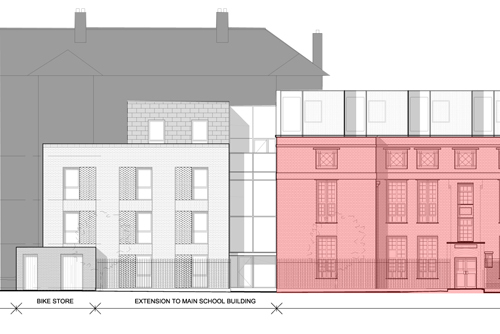 The gap between the proposed school extension and Frankham House, at just over 9 metres, represents one of the smallest gaps between buildings on the entire site. 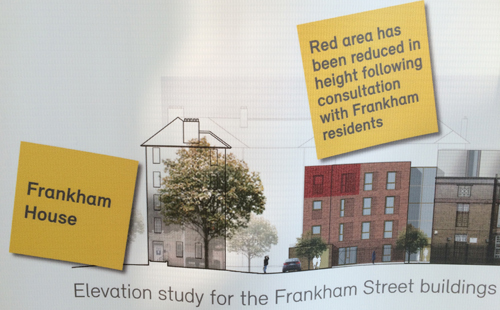 There has been a half-hearted attempt to lessen the impact on Frankham residents by setting back the fourth floor of the extension (not shown in the Design & Access statement), but Frankham's lower floors will still be affected. They may never see light again. 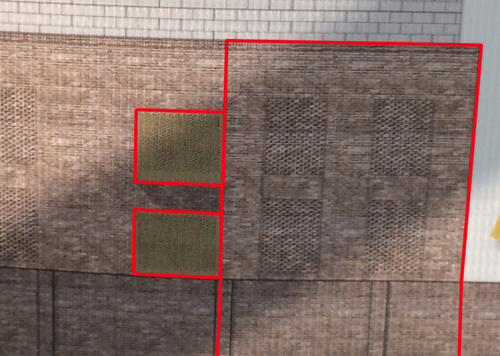 In fact the drawing shows four balcony areas (in gold). What had originally been a staircase area jutting out from the extension now appears to be accommodation with balconies – so much for no overlooking! It is also proposed that Frankham residents will be barricaded off from the development with one of the tallest fences proposed on the site. They will have no access to the proposed "private community garden" that they will overlook – unless they are willing to pay towards its maintenance. Hardly in keeping with the much vaunted claim for the "permeability" of the development. The Lewisham Open Space Strategy emphasises the need to protect and enhance existing open space and ensure major development sites adequately consider the provision of quality new open space. 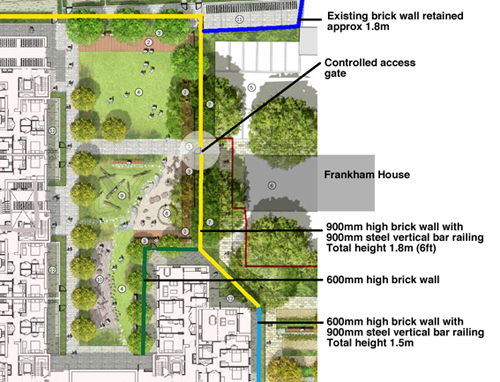 But the ‘Reginald Road Pocket Garden’ cannot be considered “high quality public realm” because of its proximity to the main road and the failure of the design to take into account the high levels of pollution, volume of traffic and the overshadowing from Block D.
In a different way, the "major new public open space" running down the centre of the site also hardly qualifies as good public realm – it has no interesting or inspired features, such as community growing areas (and where it would actually be safe to grow stuff). It will be overlooked by new private residents who will resent members of the Deptford hoi-polloi cavorting in the space outside and soon be demanding resident-only access. Or perhaps more likely, they'll be campaigning for it to be turned into a car park for the cars that they will inevitably own but have nowhere to park. Meanwhile, at the latest consultation – held two days before the application is due to expire – a representative of the developer stated they had no intention of making any further changes to their submission. 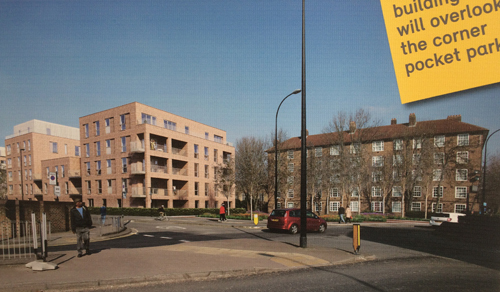 It also appeared that Lewisham Planning's Case Officer was unfamiliar with many aspects of the proposals. And for Frankham House residents it was a bit of a kick in the face to hear that Lewisham are proposing to incorporate the old school buildings into (the high street?) Conservation Area. What bloody use is that when they can't look after the Conservation Areas they have already? Las, one of Crossfields' oldest tenants, passed away in the early hours of Monday morning. 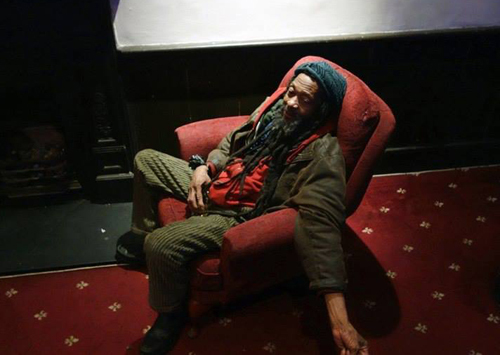 Our Rastafarian resident had lived on the ground floor of Castell House for around 40 years (or more). 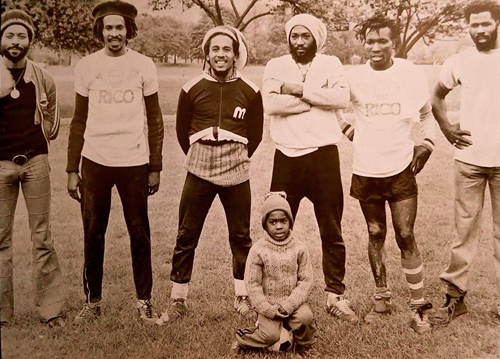 He's pictured above, on the far left, in Battersea Park in 1977 with some visiting football enthusiasts from Jamaica; below he was snapped more recently by local photographer Ben Graville, sitting in his favourite place by the Bird's Nest fireplace. 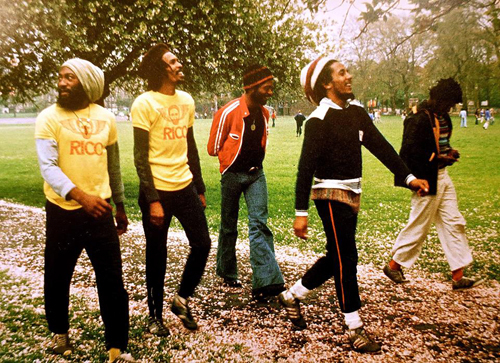 Residents and friends were shocked by the news, as although his health was deteriorating, many had seen him in the preceding days looking well enough. Many may have been unaware that some neighbours had been trying to get him to eat properly (supplementing the care he was receiving from social services), whilst the Bird's Nest had offered him only tea the previous night, concerned that his love for rum wasn't helping. Las was a pain in the neck for Lewisham Homes and social services – he was offered a flat in sheltered housing but could not bear to leave Crossfields. Occupying a three bedroom flat on his own, he was targeted long before the Bedroom Tax, and when threatened with eviction, was helped to stay on in the flat by other residents and friends. 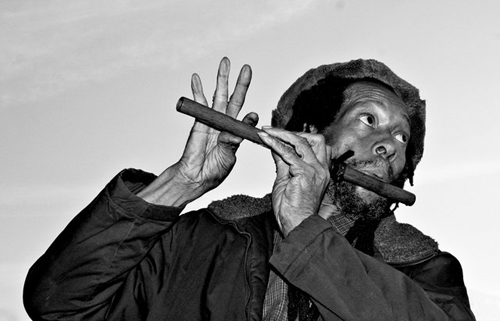 A wanderer at heart, he could often be heard playing his flute outdoors on the estate at the oddest of hours – as captured by photographer Michael Tudor's wonderful portrait below. At the time of writing, we don't know what plans Las's family have, but a tribute evening is already being planned in the Bird's Nest. Crossfields residents are thinking about planting a tree in memory – or perhaps planting out the tall exotic potted plants that have long stood outside his home (and before Lewisham Homes throw them in a skip). Thanks to Deptford music chronicler, producer and promoter (and ex-Crossfields resident) Colin Bodiam for the Battersea pics – and for the beautiful photos by Ben Graville and Michael Tudor. Update 15 May: Please see this newer post for funeral and celebration details. You won't find this on the official Deptford Southern Housing Sites website (of which the 'Frankham Street' proposals form a part). Notification has only gone to those who have submitted an objection. Pop along if you want to know more about the development, or voice your concerns (we have quite a few). Meanwhile, following our initial post about Tidemill back in February (which commented on the paltry level of affordable housing provision provided in Sherrygreen Homes' application and questioned how the proposals might be financed) the Deptford Dame expanded on the subject. She noted that the Council's original requirement was for 37% affordable units but this number had been vastly reduced in the developer's application. The total number of units proposed had gone up from 204 to 210, but the social rented accommodation had been slashed from 53 to 26, and shared ownership units from 25 to 8. She concluded that cutting the affordable units made way for an extra 50 private units – from 126 to 176 – so that the developer could make a 20% profit from the site. (Any less than 20% and a site becomes an "unviable" proposition for a developer). 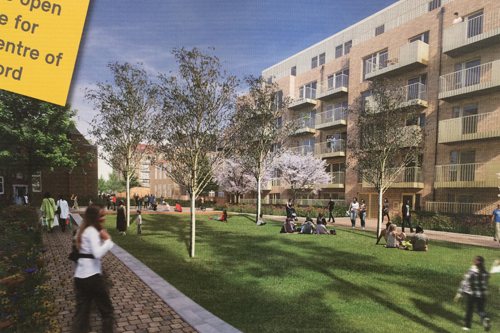 The Dame referred to the developer's 'viability report' which had been included in the 92 documents associated with the application that were available to download from Lewisham's Planning Portal. It claimed that the site was still unviable for them but they might manage a few affordable units since the Council wanted them so much. When we looked for this document we found it had been removed from public view. There are now only 91 documents! The Dame helpfully links to a long but shocking and illuminating Guardian article which looks at how developers use "viability" to maximise their gains and relieve themselves of any local planning or policy obligations. Viability assessments inevitably underestimate the value of the newly finished units (because figures are based on an average of current property values in the area) while vastly overestimating the costs to build (with an allowance for inflation). Viability is worked out on today's property prices, but tomorrow's costs – and often on land they have acquired at a discount. It's a scandalous abuse of a flawed planning system that has contributed to the housing crisis. When the Council owns the land, as in this case, it can choose, quite separate from the planning process, to negotiate the sale of the land and the volume of affordable housing beyond what is required as part of the planning application. We are pleased to report that, using this flexibility, we have reached a legally-binding development agreement with Family Mosaic, Mulalley and Sherrygreen Homes that will deliver significantly more affordable homes than that set out in the planning viability assessment. 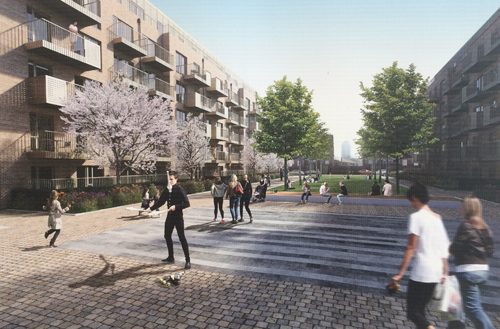 As a result, the proposed development of the old Tidemill school and Reginald Road will provide 37% affordable housing – the target level that was reported to Mayor and Cabinet in July 2015. One can only conclude that in order to satisfy the developer's demand for a 20% profit, the land is being sold for less than it's worth. The arrangement allows our local councillor and cabinet member, Joe Dromey, to happily boast "200 new homes, 40% of which are affordable, and investment in Deptford town centre. It's a good development." Trade stories, share a feast! Everything – including the kitchen sink – from Deptford Market. 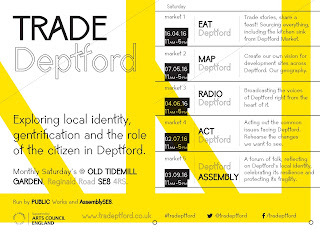 To launch TRADE Deptford we're starting with a feast of local produce and people. Come join us on Saturday 16th @ the Old Tidemill Wildlife Garden for an exploration of Deptford's incredible high street – sourcing everything from the food to the table settings. Collectively we'll cook a meal for Deptford. Throughout the day we'll lead walks of the local area and high street. We'll haggle, exchange and barter for our lunch on the market and cook a feast for all those who take part.